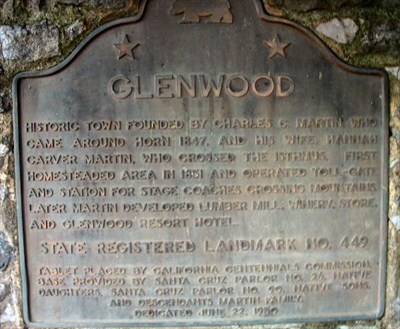 Of all the locations between Los Gatos and Felton, none came close to the size and importance of Glenwood. 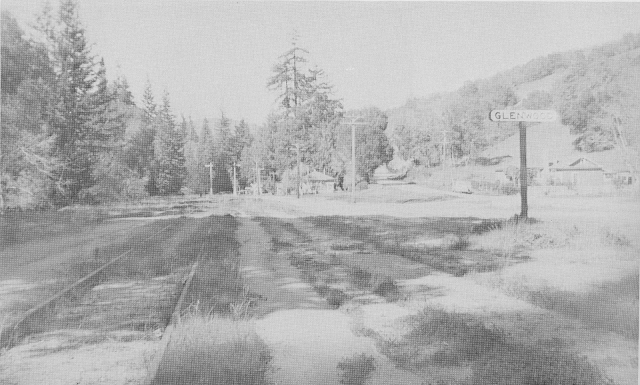 When the South Pacific Coast Railroad's surveyors first reached Glenwood, a small hamlet was already in development. The site was home to Mountain Charlie McKiernan, whose toll road passed by on the west bank of Bean Creek. John M. Bean, whose name was given to the creek, owned a small farm called Summer Home, which often hosted stage coach visitors and early tourists to the area. Charles C. Martin, meanwhile, owned and operated another farm on land purchased from McKiernan in 1851. 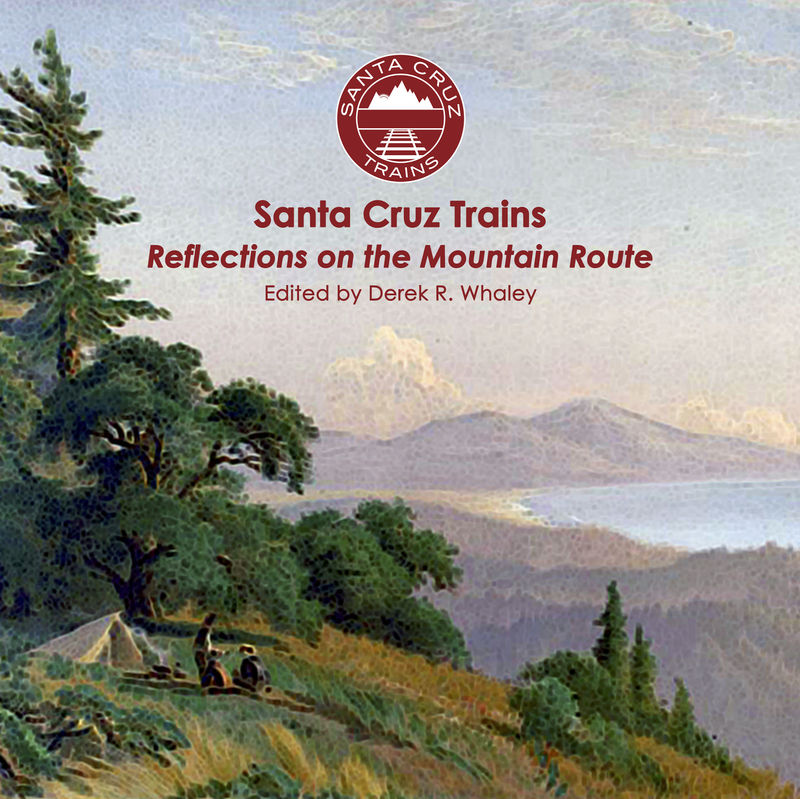 He worked for Mountain Charlie as the southern gateman for the Santa Cruz Turnpike Company's toll road. Within a decade, Martin built a sawmill and a winery in the area and purchased Summer Home so he could convert it into a full tourist resort. By the time railroad grading crews passed through the area, most of the native trees were probably gone and the Glenwood meadow, still present today, was probably fully realized. But Martin continued to develop. Throughout the 1870s, he built a school and general store. It was he who coined the name Glenwood, with some helpful advice from a friend. 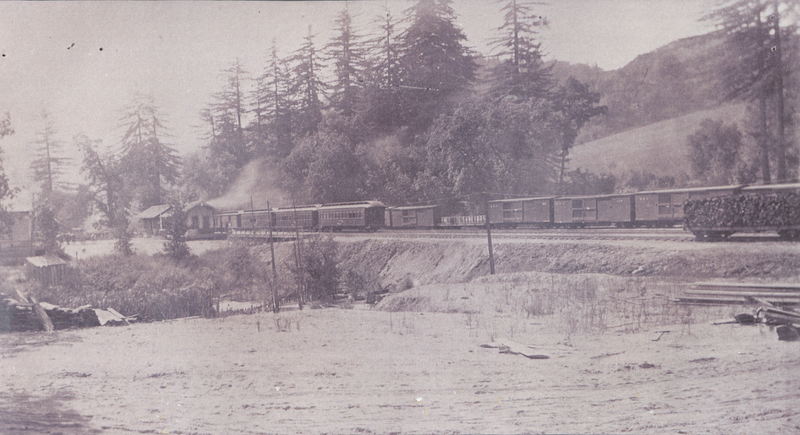 The South Pacific Coast Railroad never initially intended to pass through Bean Creek. Original plans for the railroad planned to bore a tunnel to the Soquel Creek headwaters and then direct the route down to Soquel. 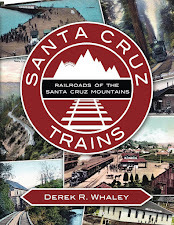 Frederick Hihn and the Dougherty Brothers, however, wanted the train to pass through the San Lorenzo Valley, thereby making it far easier to transport lumber from the valley to customers in San José and San Francisco. The railroad bowed to pressure and rerouted their line through 1.3 miles of the upper Bean Creek basin. The town of Glenwood, as it certainly was by 1880 when construction was completed, was immediately outside the eastern portal of the Glenwood Tunnel. A station was built right along the main road through town on land donated by Martin. Around the same time, the town's post office opened within the general store, with Martin appointed postmaster. Early photograph of Glenwood showing detached passenger and freight depots and three sidings beside the mainline track, c. 1890. 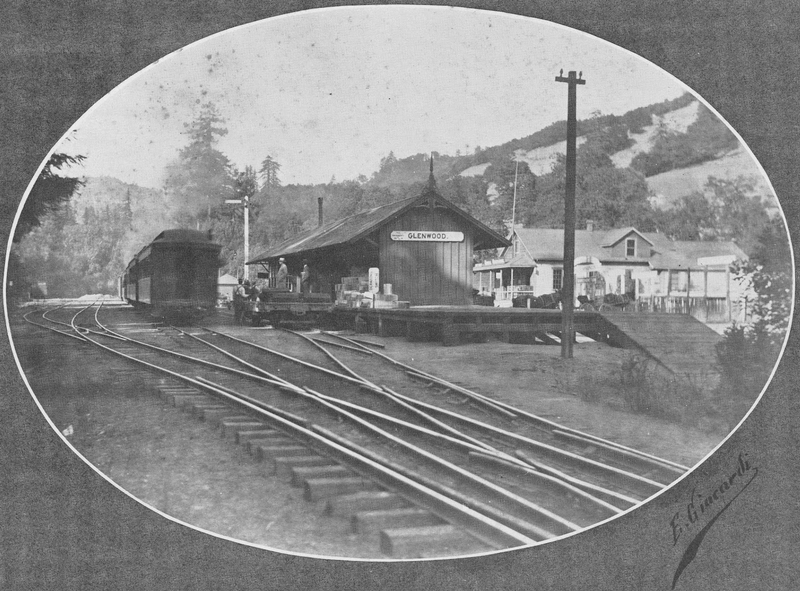 As it turned out, Glenwood served an important purpose in railroad operations. Although the town was not at the top of the railroad grade, it was close enough that the steepest portions of the route were already surpassed by the time trains made it to Glenwood. And unlike Highland (Laurel) or Wright, Glenwood had plenty of room for trains to maneuver. 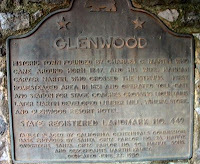 Therefore, the railroad used Glenwood as a loading area for lumber trains. They installed a turntable just south of the depot so that switch engines could run back and forth between Glenwood and Felton, which also had a turntable. Multiple train-loads of lumber-laden flatcars would be sent to Glenwood and the four parallel sidings there until no more could be sent, at which point a mainline locomotive would pick up as many cars as it could carry and haul them mostly down-grade to the lumber yards and planing mills in San José and elsewhere in the Bay Area. This practice was continued every day into the 1890s, when more efficient Southern Pacific locomotives were built that could make the entire trip over the mountains. To mark this transition, the separate passenger and freight depots at Glenwood were combined together around 1895 and a Victorian-style ticket window was installed on the side facing the tracks. Remodeled Glenwood depot showing the combined passenger and freight building with extended platform, c. 1895. Glenwood was not simply an industrial town, though. Even before the railroad's arrival, McKiernan, Bean, and Martin had been responsible for clearing the meadow of trees and establishing the first hostelries in the area. The railroad accelerated this process. By 1900, numerous resorts had opened in and around the Glenwood meadow including Mount Pleasant Farm, Villa Fontenay, Summer Home Farm, and the popular Glenwood Magnetic Springs Resort & Spa. 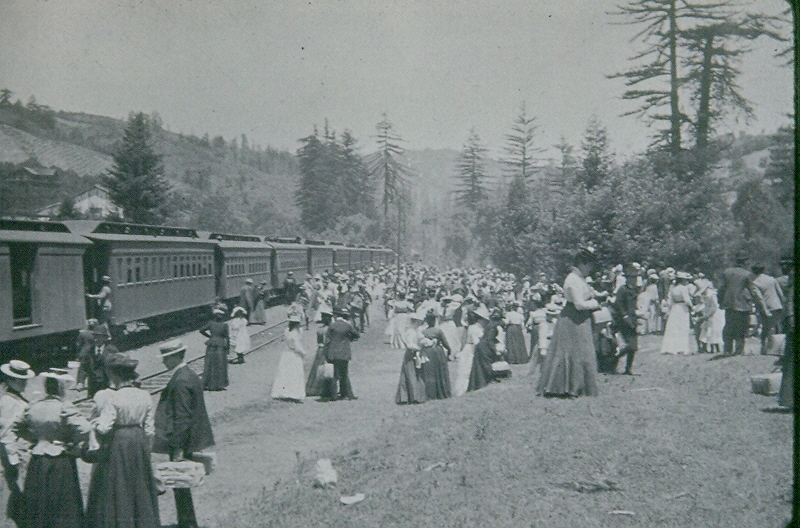 Whereas picnickers would travel to Bunker Hill Park, Forest House, and Sunset Park for daily picnic trips, tourists would come to Glenwood for full summer vacations. Campgrounds sprang up alongside Bean Creek, and the creek was inevitably dammed seasonally to create an artificial lake. The redwood forests to the north of Glenwood provided ample hiking opportunities, while the wildlife in the region was not yet so tamed that hunting expeditions were out of the ordinary. Glenwood thrived in the decades prior to the widespread adoption of the automobile as a safe and accessible wilderness. The broad-gauging of the tracks at Glenwood between 1906 and 1909 had a contradictory impact on the town. A wider gauge meant that heavier-duty trains could transport more people to Glenwood, which is indeed what occurred in the early years of the 1910s. However, the steep decline of commercial logging operations in the area meant that most of the sidings were either outright abandoned or went into disuse and the turntable was torn out and filled with concrete. Further repairs and upgrades made in the 1910s straightened the right-of-way significantly, culverted Bean Creek more efficiently, and generally improved the ride through the Bean Creek area. Thus, even as rider experience and capacity along the line increased, the commercial function of the line, especially in the Glenwood area, became non-existent. For the sake of Glenwood, the railroad became exclusively a passenger affair. Yet even that passenger function came to a quick end beginning around 1916, when California built the Glenwood Highway straight through town. The highway, completed in 1920, connected Santa Cruz and Los Gatos along a mostly new alignment. Martin donated vast tracts of land to ensure that the road passed through his resort valley, and the gamble paid off for the next decade. Motorists began arriving in Glenwood in droves, stopping to refuel at the new gas station installed beside the general store or spending the night in one of the rustic mountain hotels. But the days when affluent families would spent the entirety of their summers in a single resort had come to an end. Resort patronage sharply declined as travelers preferred to take single-day excursions to the Santa Cruz beach. The Glenwood Hotel closed in 1924 and other resorts around the same time. 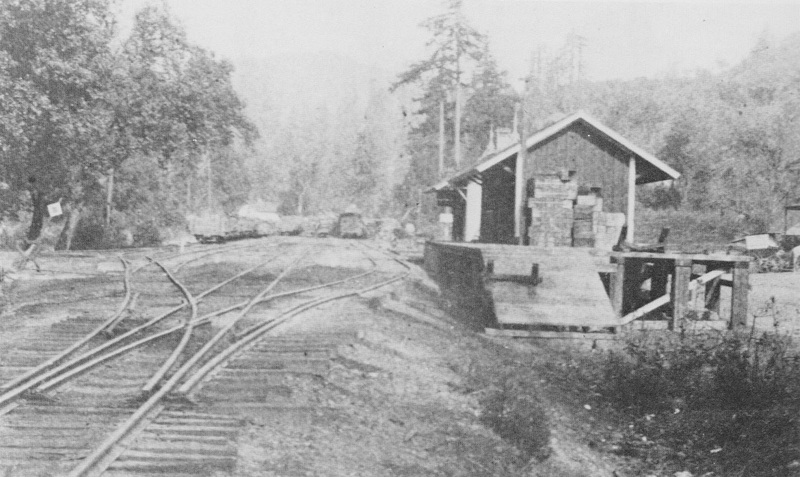 The Glenwood depot grounds just before the railroad pulled out the remaining tracks, 1941. The rapid rise of automobile usage also meant that railroad patronage was on the decline. Glenwood's freight depot closed in 1927 and the passenger agency permanently closed August 16, 1939, after which it was demolished. By the early 1930s, the impact of the Great Depression ended any remaining resort operations in the area. Soon afterwards, construction of State Route 5 (later State Route 17) began which would virtually erase Glenwood from the map. 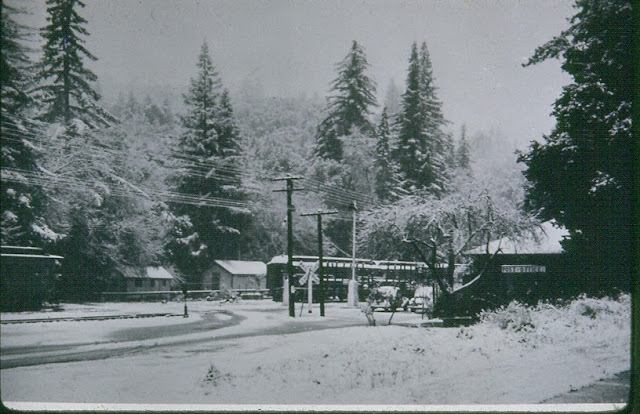 In 1934, traffic was diverted to a new road that passed above Glenwood, thereby bypassing the town. The general store and gas station both closed as a result. Trains continued to pass through Glenwood for the next six years, occasionally stopping for waiting passengers, but few probably used the stop. Storm damage caused by winter rainfall on February 26, 1940, led to the permanent abandonment of the route. Within two years, the tracks would be pulled, the block signals removed, and the tunnel portals sealed. Almost all remnants of the town were gone by the time World War II began. The last straggler was the post office, which continued to operate until April 1954, with Martin's great-granddaughter, Margaret Koch, serving as its last postmaster. The Glenwood townsite is accessible via Glenwood Road. Heading north from Scotts Valley, it is located in a wide meadow surrounded by high hills just north of where Glenwood Cut-Off meets Glenwood Road. The site is California State Historic Landmark #449, a marker for which is at the site of the station on the west side of the road. All of the property in the area, including the entire right-of-way between the Glenwood Tunnel's east portal and the Mountain Charlie Tunnel's west portal, is privately owned and trespassing is not recommended. Very limited evidence of the railroad remains other than the tunnel portals and a single concrete semaphore foundation located near the former station. Cool stuff, Derek. You're becoming an expert on this history! I finally am getting a little more of this Facebook stuff figured out. Interesting reading. Let me know sometime when you're going to go hiking about the old railroad sites and I'd love to tag along. These photos are awesome. Way to go!!!! Great pictures of the train station. where are these come from? first time I have seen these north bound shots. Note, Margaret Koch passed away in 2011. The last of the Martin lineage who lived in Glenwood is Catherine Koch Rebhahn, daughter of Margaret passed away in 2006. Follow the link at the top of the stereoscoped photos to see those. I'm not sure where the rest came from. I found them searching through Google and Google Images and forgot to cite them (I'm trying to be better at that now). That's unfortunate about Margaret dying. I had read a little bit about her, I think, when doing some of the research on the area. With Catherine gone, who was the next of kin? Perhaps someone inherited the family's photos and relics. Wonderful! I have a couple of photos of Summer Home farm and now I know where it was. Great stuff as usual Derek. I kept wondering why I have never seen that meadow on Glenwood Drive until the end of your story. Too much of these mountains have been privatized in my humble opinion. : - ( It's always so shocking to see the mountains mostly stripped of trees in these old photos. Makes me appreciate folks like The Sempervirens Club all that much more. Great work Derek!